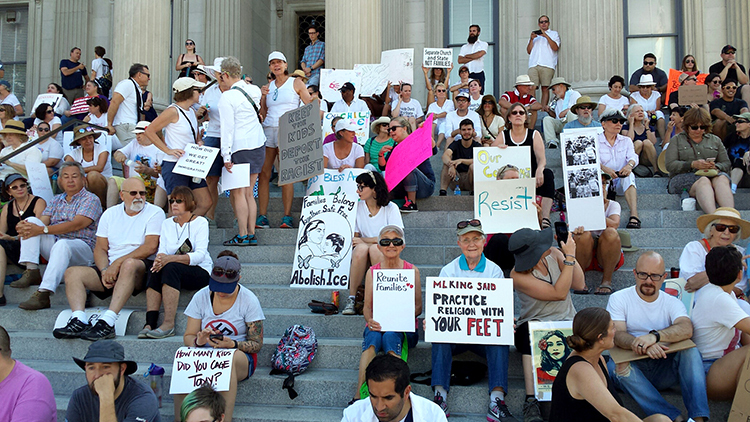 July 5, 2018, Adrian, Michigan – Adrian Dominican Sisters added their voices to thousands of others on June 30 as they participated in Families Belong Together marches throughout the United States. Demonstrations throughout the nation protested the U.S. immigration policy that has separated children from their parents at the U.S.-Mexico border as the families attempted to enter the United States without formal documents. A small group of activists gathers in front of the ICE building in Detroit before moving on to other rallies in the Detroit area. About 20 Adrian Dominican Sisters were present for the rally in Adrian. 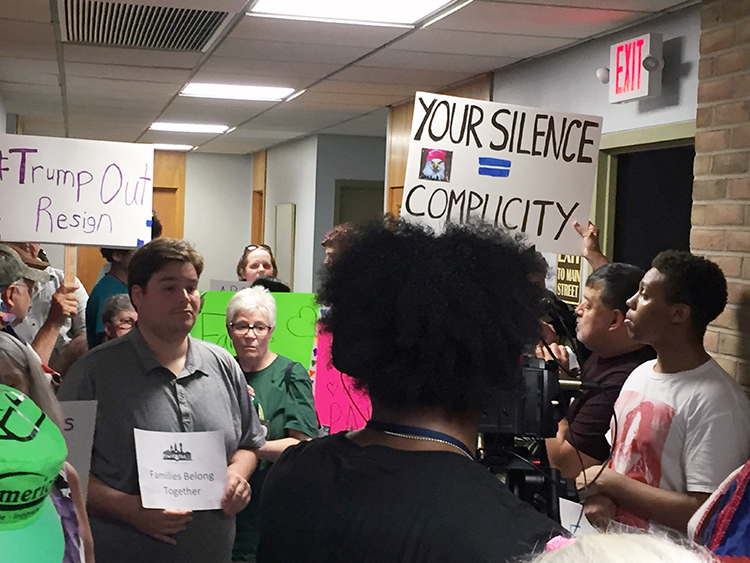 Sister Kathleen Nolan, OP, Director of the Congregation’s Office of Justice, Peace and Integrity of Creation, noted that the people of Adrian have been consistently attending rallies calling for social justice – from the Poor People’s Campaign and March for our Lives to the June 30 Families Belong Together March. “There was a lot of enthusiasm,” she said. “It was very encouraging.” The rally began at 11:00 a.m., and by noon, the crowd had grown to 150. 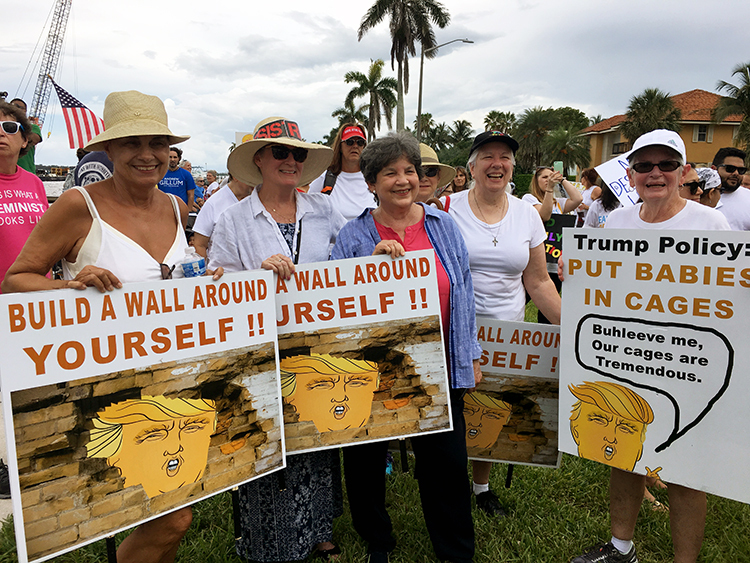 Sisters Judith Rimbey, OP, second from right, and Patricia Leonard, OP, right, participate in the rally in West Palm Beach, Florida. 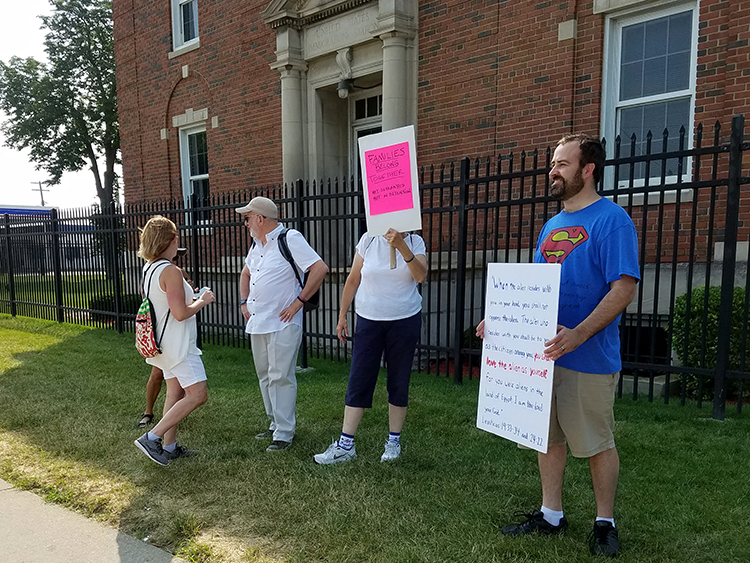 The Families Belong Together rally in Saginaw, Michigan, on July 2, 2018. Sister Cheryl Liske, OP, a community organizer, attended the Families Belong Together Rally on July 2 in Saginaw, Michigan. She accompanied members of the Ezekiel Project of Saginaw, one of four organizations that were called upon to speak during the rally. About half of the people who attended the rally then went to the office of Rep. John Moolenaar (R-Mich.) to present a cage full of toys for the children at the border. The action was in reference to reports that children at the border had been put into cages. Sister Virginia “Ginny” King, OP, attended two rallies in the Detroit area, the first in front of the U.S. Immigrations and Customs Enforcement (ICE) building in Detroit. From there, she attended a related rally at the Hart Plaza in Detroit, traveling with “a small but diverse group,” she recalled. Feature photo (top): Participating in the rally in Adrian are, from left, Sisters Joella Miller, OP; Maurine Barzantni, OP; Corinne Sanders, OP; Carmen Álvarez, OP; and Sara Fairbanks, OP.